I was recently asked to review a book; I enjoyed the book and thought the compelling content would be useful to others, and so am sharing it with you as well. 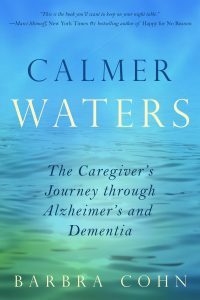 In her book Calmer Waters: The Caregiver’s Journey Through Alzheimer’s and Dementia, Barbra Cohn provides a firsthand account of her husband’s diagnosis of Alzheimer’s disease and life thereafter, an experience that will feel eerily familiar to most caregivers and their loved ones with dementia. With no hope or encouragement from the doctor, Barbra and Morris drew upon their spiritual practice and experience to obtain comfort, peace, and inspiration. Cohn talks about finding strength both in spirituality and in what some would term “alternative therapies,” and how she and Morris enhanced their spiritual connection beyond a caregiver/care recipient relationship. Cohn also invites the reader to follow their Alzheimer’s journey from when they first noticed symptoms to Morris’ death in 2010, even including the eulogy from Morris’ funeral to provide a fuller picture of who Morris was both to his wife and family, and to his community. Calmer Waters incorporates stories from other caregivers, and twenty “healing modalities” that Barbra either incorporated into her and Morris’ life or researched especially for her readers, written by experts in those areas. Included are dance, drumming, light and color therapy, music therapy, horticulture, yoga, exercise, nutrition, self-massage and much more. Where applicable, Cohn writes about how she or her husband integrated a therapy in their lives; some therapies were enjoyed by Morris, while others were used by the author herself. 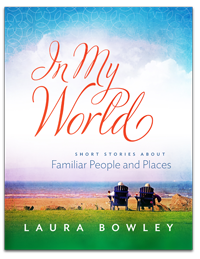 I found Calmer Waters to be a refreshing read, in line with current thinking that there must be more to life with dementia than is currently depicted in the story of dementia we tell. In a time where physicians, while well-meaning and well-intentioned, tend to provide little in the way of informing people on how to “live” with dementia, Barbra Cohn’s book goes a long way in helping caregivers and people with dementia to fill the gap in support after diagnosis. Readers will find that Barbra uses the term “care partner” in reference to Morris, which I found very interesting. As you probably know, “care partner” is used in some circles to refer to the “care giver” to show that the care giver and care recipient are equal partners in care. Using terms such as “care partner” tend to equalize the relationship between care giver and recipient. While I found the use of “care partner” in reference to the recipient a little unsettling at first (simply because it wasn’t how the term is normally used), I actually like it; why should the care giver get to be a “partner” but not the recipient? The chapters about the healing modalities are quite useful and the book may be a guide into the future for readers to refer back to when the time is right for that therapy to be used. However, because each chapter is written by different people, the tone and amount of detail provided differs from chapter to chapter, and I found some to be overly detailed or using language that exceeded my knowledge or was too technical to keep me interested. The parts that I found most compelling, not to mention beautifully written, are when Cohn talks about her and Morris’ own personal experience, either with Alzheimer’s in general, or with a specific modality. For me, I would have rather had more “Barbra and Morris” and a little less modality, or would loved to have seen each modality written about in Barbra’s own words, with reference to the expert at the end of each chapter. A tall order I know. In any case, care partners, whether giver or recipient, will find Calmer Waters to be a calming and inspiriing experience all-round, an informative read, and a great reference for when circumstances call for trying something different.